Baking Soda + Hydrogen Peroxide = Wow! Months ago, I repinned a pin about using baking soda and hydrogen peroxide to clean the gunk off of baking sheets. You know what I’m talking about, the sticky gross residue leftover from before you discovered parchment sheets rather than Pam. Since I’m skeptical about, well, everything, I didn’t have high hopes for this project. But I’m happy to report that the concoction works and it’s easy to make and use! Simply mix baking soda and hydrogen peroxide until it forms a paste, then apply it with a sponge or brillo pad and lightly scrub. 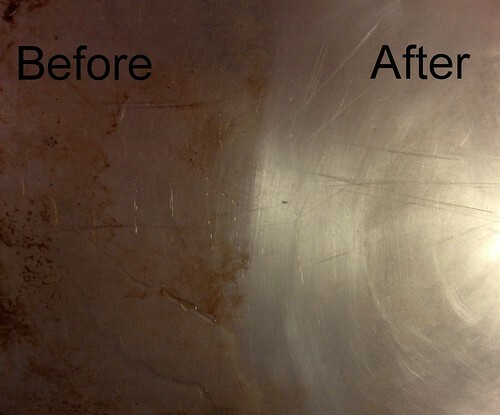 The ick comes off with minimal elbow grease and your baking sheets will look like almost new. I have some icky baking sheets, and a roaster. Going to give this a try. Thanks! Thanks for the great tip – mine are totally in need of a good scrub!!! I wonder if it works with silicone mats too, you know those stained after several times in the oven. I’ll have to try this out. I have a couple of pans that are blackish brown in the corners and slightly sticky no matter how much I wash them. @Cla – I’m not sure, but if you try it let me know!